MiraSWAB. The head of these swabs consist of the MiraWipe microfiber fabric over foam. 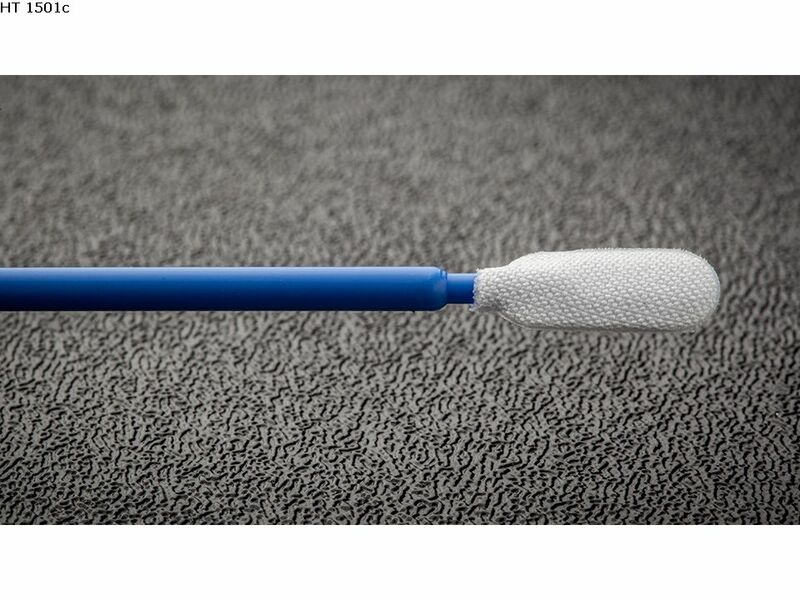 MiraSWAB® 1500 and 1600 Micro Fiber Series Swabs feature a patent-pending tip constructed with single and double layers of micro fiber fabric over foam and polyester layers. The double layer tip design enhances cushioning and conformability to work surfaces to enhance cleaning of recessed, hard to clean surfaces. Single layer tip designs are ideal for cleaning very tight areas such as 90 degree angles. All swab tip materials use thermal bonding techniques to provide a sure, clean connection to the polypropylene shaft. MiraSWABS are cleaned in an ISO Class 5 clean room via a proprietary process to provide extremely low particle and NVR levels and streak free cleaning performance even when solvents such as Acetone, Methanol and Ethyl Ether are employed. MiraSWABS® micro fiber swabs resist degradation from abrasion and aggressive solvents such as Acetone for the most demanding operations. MiraSWABS® micro fiber swabs, for the first time offer the cleaning performance of micro fiber fabrics with the scratch free properties of foam for Optics, HDD, Semiconductor, Electronic assembly and Biomedical applications. • Cleaning applications that require IPA, acetone, MEK, NMP and Kyzen. • Clean adhesive stains and water spots from Medical Devices. • Replacing Cotton and Chamois swabs in applications requiring cotton like absorbency without the fibers.